“A premier singer and master teacher here tells other singers how to get the most from 151 famous arias selected for their popularity or their greatness from 66 operas, ranging in time and style from Christopher Gluck to Carlisle Floyd, from Mozart to Menotti. This book continues the work Martial Singher has done, in performances, in concerts, and in master classes and lessons, by drawing attention ‘not only to precise features of text, notes, and markings but also to psychological motivations and emotional impulses, to laughter and tears, to technical skills, to strokes of genius, and even here and there to variations from the original works that have proved to be fortunate’. 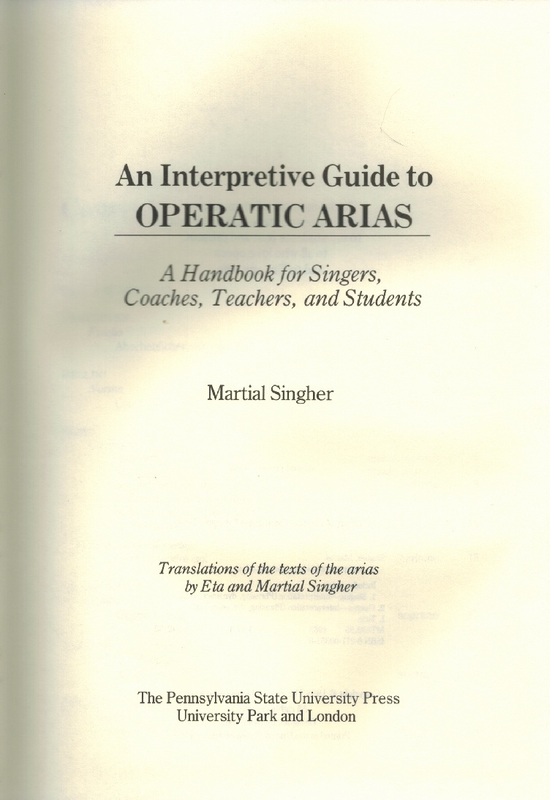 For each aria, the author gives the dramatic and musical context, advice about interpretation, and the lyric—with the original language (if it is not English) and an idiomatic American English translation, in parallel columns. The major operatic traditions—French, German, Italian, Russian, and American—are represented, as are the major voice types—soprano, mezzo-soprano, tenor, baritone, bass-baritone, and bass. The dramatic context is not a mere summary of the plot but is a penetrating and often witty personality sketch of an operatic character in the midst of a situation. The musical context is presented with the dramatic situation in a cleverly integrated way. Suggestions about interpretation, often illustrated with musical notation and phonetic symbols, are interspersed among the author's explication of the music and the action. An overview of Martial Singher's approach—based on fifty years of experience on stage in a hundred roles and in class at four leading conservatories—is presented in his Introduction. 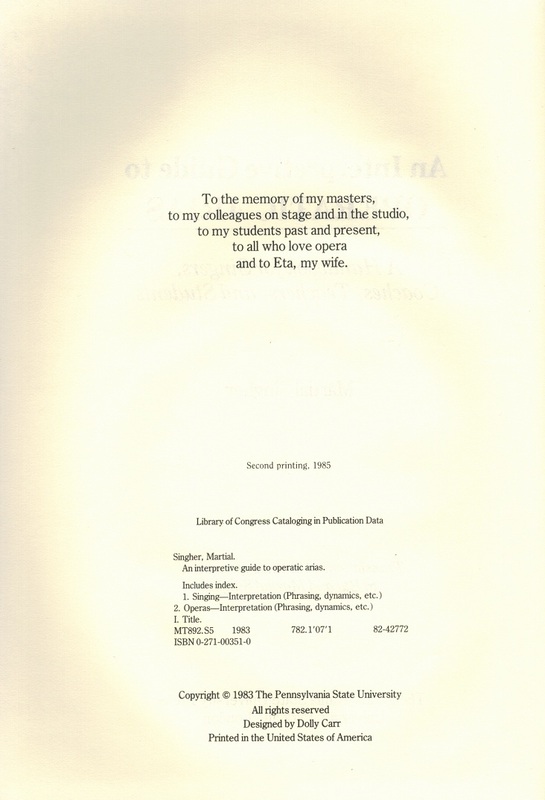 As the reader approaches each opera discussed in this book, he or she experiences the feeling of participation in a rehearsal on stage under an urbane though demanding coach and director. THE INTERPRETIVE GUIDE will be of value to professional singers as a source of reference or renewed inspiration and a memory refresher, to coaches for checking and broadening personal impressions, to young singers and students for learning, to teachers who have enjoyed less than a half century of experience, and to opera broadcast listeners and telecast viewers who want to understand what goes into the sounds and sights that delight them. “Martial Singher, a French baritone, made his Metropolitan Opera début in 1943. He made his début at the Paris Opéra in 1930 and soon became a principal baritone with the company. After 11 seasons with the Paris Opéra he enjoyed many guest appearances in Europe and South America. In more than 100 opera roles and in recitals with leading orchestras, he eschewed showmanship and histrionics and stressed smoothness, subtlety and clarity. He was particularly celebrated for the lean, elegant phrasing of his native French repertory. Of his Met début as Dapertutto in LES CONTES D'HOFFMANN, Virgil Thomson in THE NEW YORK HERALD TRIBUNE reported Mr. Singher ‘gave a stage performance of incomparable elegance and did a piece of singing that for perfection of vocal style had not been equaled since Kirsten Flagstad went away’. Several weeks later at the Met Singher sang his first Pelléas. Mr. Thomson found him 'the glory of the evening, vocally impeccable and dramatically superb’. Olin Downes of THE NEW YORK TIMES hailed the baritone as ‘a fine and experienced artist, an authoritative actor, one firmly grounded in the traditions of his language and stage action and a potent element of the occasion’.